Mit dem XCI Explorer könnt ihr euch eure ROMs/Dumps genauer anschauen, diese entpacken sowie eure Zertifikate extrahieren bzw. injizieren. Removed the need for nstoolmod (thanks to Giba). This release should work for Windows 7 users too. For now, I've decided to use a modified version of nstool for loading NSP files. While this is a workaround, this makes it just as fast (if not faster) than loading XCI files. Files have been restructured so all tools (hactool + dependencies + nstoolmod) are located in the "tools" folder. Open an issue if a file doesn't work properly and I'll try to figure out why. Thanks! This release brings the ability to load metadata from NSP files! Loading NSP is very slow because the program has to basically extract the whole NSP. Also included a temp fix for crashes for some XCI files.Thanks GibaBR for most of the code. Nothing notable in this release except the TitleID being displayed correctly. This fixes the program from becoming unresponsive while extracting NCA files.This is a pre-release because it needs more testing and polish. GBATemp doesn't like the keys.txt being included with the release, so it has been removed and Get-keys.txt.bat has been included. If you run the program without keys.txt, you'll be prompted to download/include them. This release adds drag and drop capabilities and some minor fixes. Just drag the XCI to the file text box (where the path would be located) and it will automatically load that file. Check the partitions tab for a new feature! You can now check the integrity of your NCA files before you extract them. Just click on an NCA and look at the bottom for information (green = match, red = corrupt). Once again, thanks to klks for this release. Thanks to klks for kindly fixing CARD2! Minor UX tweaks and most likely my final release. A real developer needs to fix the underlying issues with CARD2, partitions, and metadata. Another temporary fix for CARD2 games. Currently XCI Explorer only supports CARD1 metadata. Added another temporary fix for games that crash with unknown side effects. Some games still crash. Working on a fix. This is the same as the version from MaxConsole. Ich biete hier eine bereits zusammengestellte Version des Tools an. Wenn ein Update anstehen sollte, werden einfach die bestehenden Daten durch die aus dem aktuellen Release überschrieben. Die Version hier ist die v1.4.6. 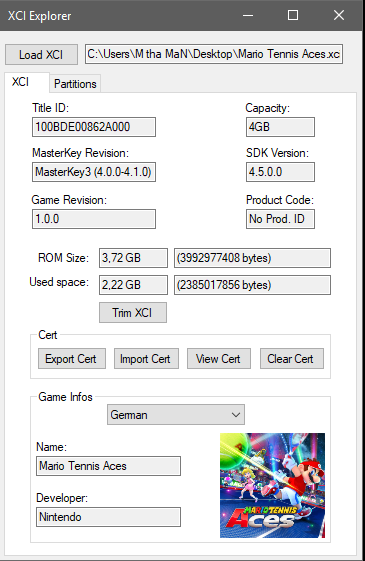 Die in dem Download enthaltene keys.txt Datei (Dummy) muss durch die eigenen Keys ersetzt werden. (prod.keys umbenannt zu keys.txt) Wer seine Keys noch nicht besitzt, kann sie nach dieser Anleitung auslesen und erstellen lassen. hallo. habe gerade bei einem Spiel die angehängt Fehlermeldung bekommen. was bedeutet das? Wahrscheinlich hast du dieses Game irgendwo runter geladen und das Tool kann es nicht öffnen, weil es möglicherweise Schadcode enthält. Wenn dem so sein sollte, endet der Support dafür hier!